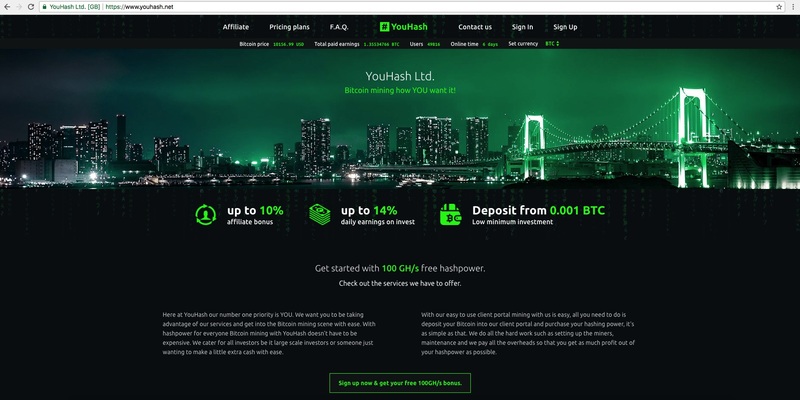 YouHash (YouHash.net) functions as an online cloud mining service that was incepted on February 6th, 2018 by an entity known as Sebastian Kennedy of YouHash Ltd.
YouHash.net is an online platform that allegedly renders a cloud mining service where investors who deposit into their platform will receive hashing power and a lifelong membership of earnings. Compatible with solely Bitcoin, YouHash’s minimum deposit requirement is 0.001 BTC while daily earnings on deposited funds can amount to a ROI of up to 14%. Investors who deposit with YouHash will allegedly receive a 100% ROI within 10 days while the minimum withdrawal amount supported is 0.0002 BTC. Affiliates who support their platform will receive between 1% to 6% per conversion. YouHash.net is owned and operated by a UK based corporation known as YouHash Ltd. under company number 11193353. According to a CompaniesHouse report, YouHash Ltd. was incorporated on February 7th, 2018 by Sebastian Kennedy and has a registered office address of 2D Park Place Villas, London, United Kingdom, W2 1SP. According to a WHOIS report, YouHash.net was registered on February 6th, 2018 through the NameCheap registrar by Sebastian Kennedy of YouHash Ltd.
Disclosed contact information we found in regards to YouHash would be their telephone number +44.857174952, email address of [email protected] along with their Facebook page. After extensively investigating into YouHash.net website, we must admit we were not delighted with the discoveries that we excavated. While their site may appear legitimate at first glance, a deeper look into their ownership and operational parameters will reveal the contrary. No blockchain transactions are included on their domain to verify alleged paid earnings to date while no mention of employed mining hardware and data-center locations are disclosed anywhere upon their site. YouHash.net does not possess a SimilarWeb global rank indicating to us that their domain receives little traffic, if any at all. As we have shown several times, UK business registries are easily deceived by newly established corporations. A search of YouHash Ltd registered office address (2D Park Place Villas, London, United Kingdom, W2 1SP) fails to generate any credible results or a visitable location. YouHash promotes unrealistic ROIs for investors yet fails to include any verifiable or transparent evidence to back up their bold claims. Operating nearly identical to a Ponzi scheme, if YouHash’s asserted ROIs are to be believed then they actively employ an unsustainable business model. After weighing the information disclosed in our unbiased review, we feel that YouHash.net is not a trustworthy investment opportunity and is likely a Ponzi scheme. We ask that you please share any experience, insight or opinions you may possess regarding YouHash.net by leaving a comment below! fortunately I still don’t invest on it. I guess entering now is the best choice. Entering too late in the system is too risky. It’s running for 6 days now. It could run for 30 days or so before it crashes. But as long as I get my ROI, then whatever happens after that is just a bonus. lo cierto es que emining.club a estado sufriendo ataques constantes DDOS, Y ese fue el motivo de su caída en la red, actualmente todos los users de e mining club han recuperado el 100 por ciento de sus fondos. referente a youhash. grrrrrrrrrrrrrr , es cierto que no me huele bien, por el formato, y el diseño. es muy similar al de otras scam. pero hay que mirar una cosilla antes de nada, las minas que regalan ghz en realidad no regalan nada. lo mas posible que no recuperes tu inversion. así que la pruebo hasta el mínimo de retiro. sin inversión. debería dejarme hacer reinvest, si no es asi, es un fake. ademas si nos fijamos en los copyrights, son idénticos en formato y tipò de letra a otras scam.